This is why the quiet little science nerd you barely knew in high school has the last laugh. Those nerds took copious notes during chemistry and biology class, while the rest of us were doodling and passing notes. Then they grew up to invent products like this one, eventually purchased by the high school varsity quarterback who is now fifty and working as a security guard, and the prom queen who has been divorced three times and put on forty pounds. The product is essentially a powerful electric fence on a stick. Deer are attracted by a lure scent, they stick their nose or tongue down for a whiff or a lick, and are jolted by 400 volts, which kills them where they stand. They don’t even fall over, the electricity fuses their bones together and they decay upright. Just kidding. 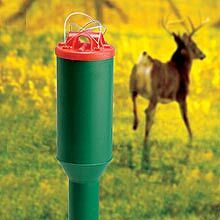 What really happens is the deer receive a light shock (the product delivers 400 volts with virtually no amps, substantially less than a static shock from a car door) and they don’t like it. They rear back and run, and learn quickly that your yard is no place to graze. One device covers approximately 1,200 square feet and is powered by two AA batteries that will last over a year.